The Pyramids follow the broad Avenue of the Dead. The Temple of the Moon sits at the north end. 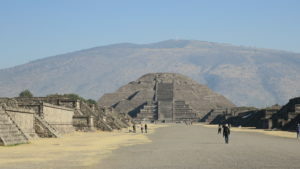 The Temple of the Sun sits midway down the Avenue. 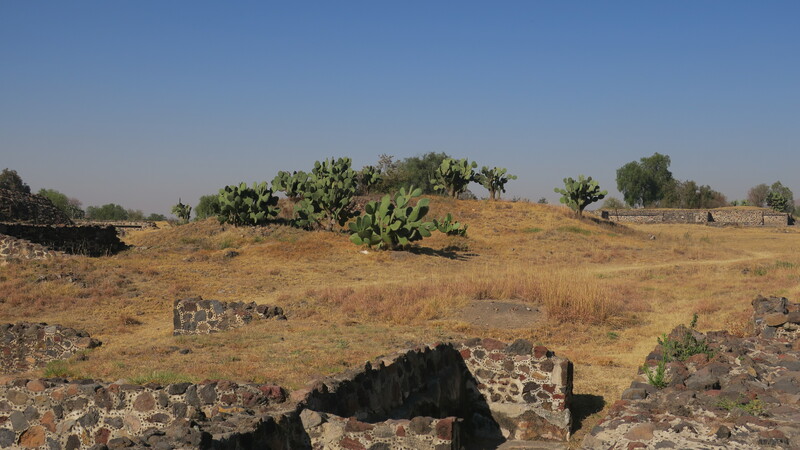 Visiting Teotihuacan is best in the morning. The gates open at 7:00 am. Mornings avoid the heat of the day and the tour buses that start arriving around 10:00 am. 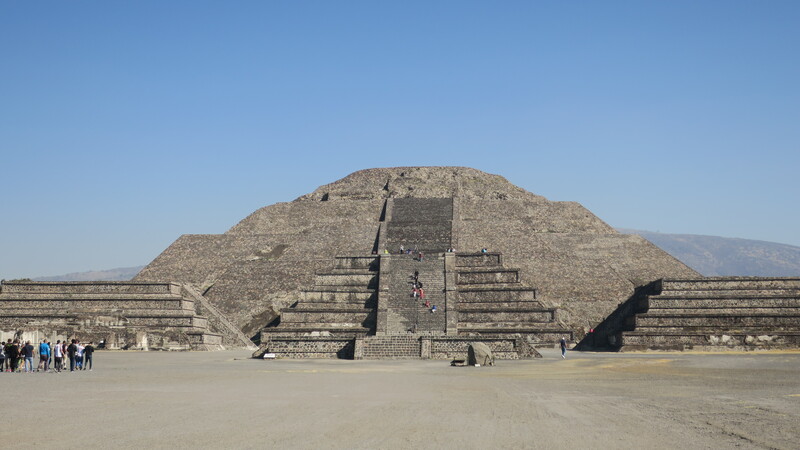 The Temple of the Sun is the 3rd largest pyramid in the world next to Cheops in Giza / Egypt and one near near Puebla, Mexico. Unlike it is its peers, visitors can climb to the top of the Sun. The pyramid is just massive. 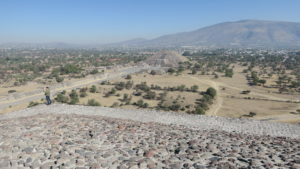 Teotihuacan sits at 7482 feet making climbing the Pyramids a work-out. I could definitely feel my breathing. It represents a different type of hiking. 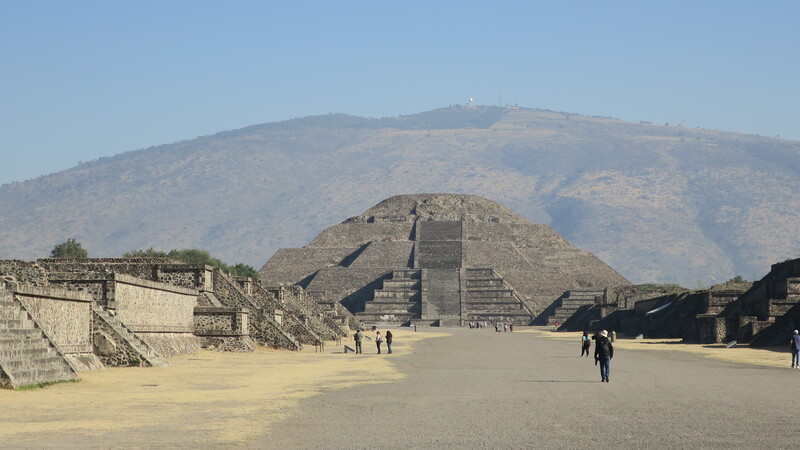 The Pyramid of the Sun has 248 steps that climb 230 feet in height. 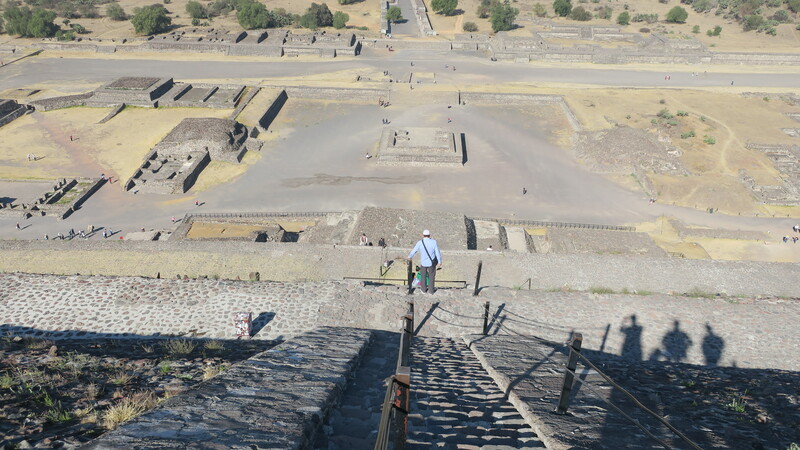 I felt like an extra in a Clint Eastwood spaghetti western at Teotihuacan. The high altitude plain is dry with many cactus. Ruins dot the area. 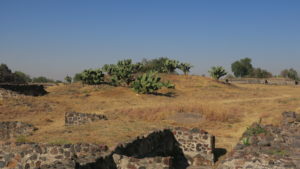 The low lying hills are unexcavated pyramids. Walking toward the Temple of the Moon along Avenue of the Dead. The best view of the Teotihuacan comes from the Temple of the Moon. 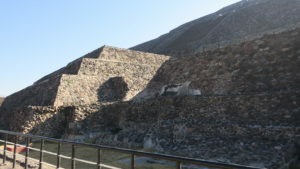 Visitors to Teotihuacan can half way to the top. Visitors view the Avenue of the Dead, Temple of the Sun, and many palaces and residential structures. 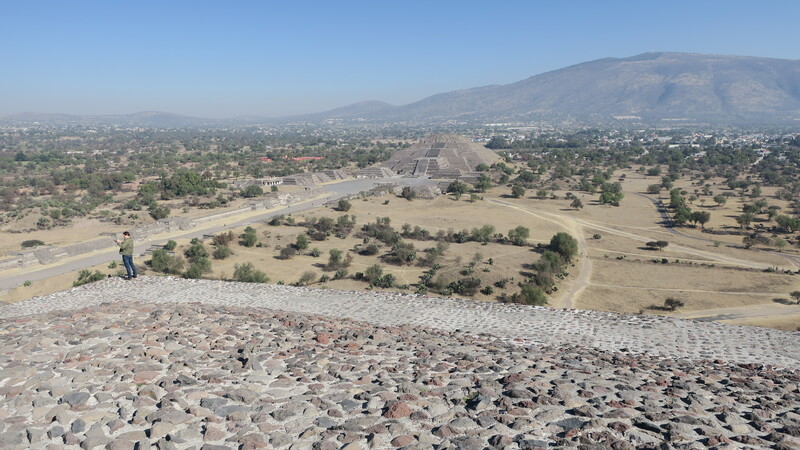 Teotihuacan is only 50km the center of Mexico City. It is about 40 km the airport. 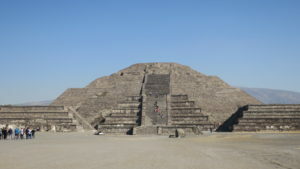 The site is easily accessible via public transportation from Mexico City. The bus station is adjacent to the Autobuses del Norte metro stop. 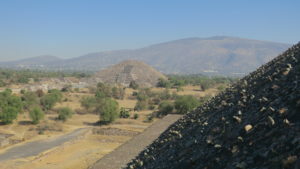 A round trip bus ticket to Pyramide or Zona Arqueologico costs only 100 pesos ($5). The enterance fee is 75 pesos. Sunday’s are free to local residents making the site especially popular with local families. Time was at a premium for me, so I hired a private car & guide through my hotel. 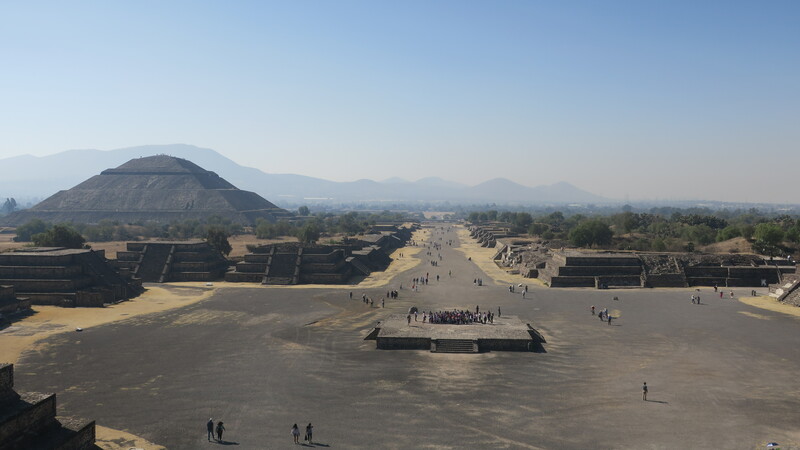 We visited Teotihuacan and then traveled to the airport for my flight home. This approach helped us leave Mexico City at an early hour, visit Teotihuacan before the crowds, optimize traffic, and return to the airport in plenty of time. I highly recommend Visiting Teotihuacan, the Mexican Pyramids. It is a world class destination.